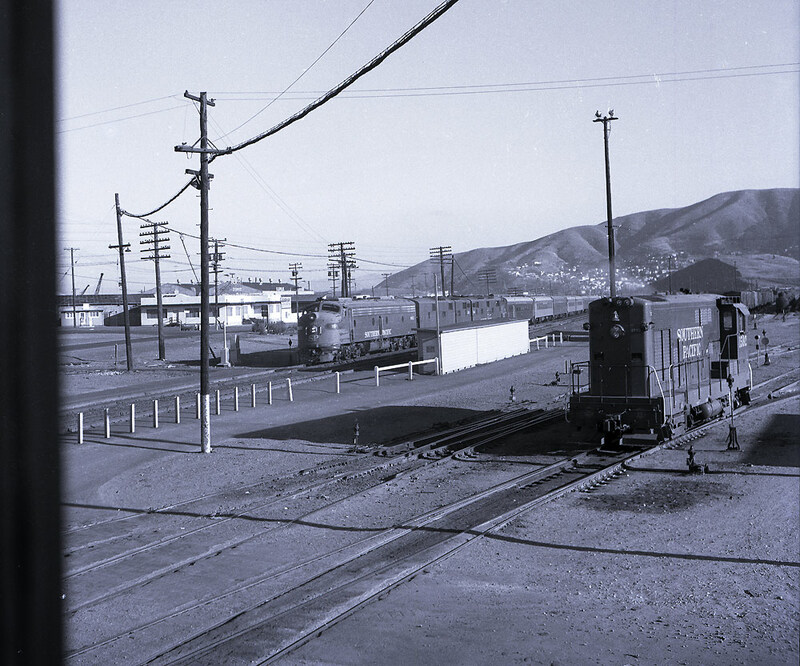 On Southern Pacific, as with most railroads, the two generally-approved appliances utilized for crossover movements between two parallel railroad tracks were /are crossovers and slip switches (further sub-divided into "single" and "double" categories). Two other common, but unapproved methods were: 1) derailing and going sideways at a facing-point switch whose rotten ties and adobe ballast had dissolved due to winter rains; 2) backing and going sideways through a facing point switch, whose misaligned points you had previously trailed through (vernacular: you had "run-through" the switch). These latter two methods usually were unsuccessful, although they could get you into the ballpark of the next track, given enough momentum. 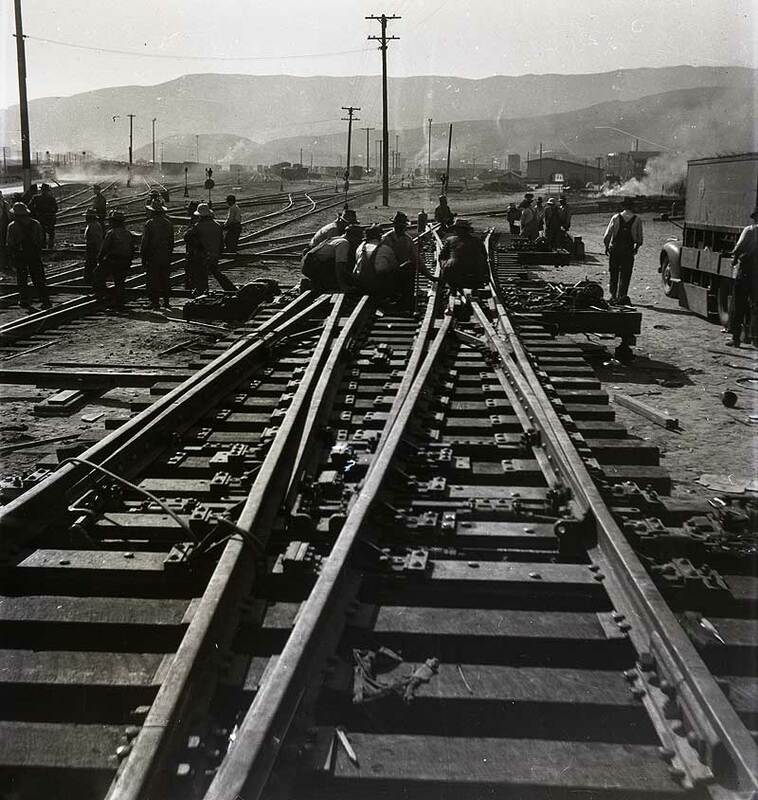 The setup for a continual repeat of unapproved method #2 is depicted in the photograph that you see here, of a crew readying a double slip switch (a double crossover can also be seen in the background, for comparison) for installation at the top end of Bayshore Yard, in about 1950 as near as we can tell. Since Wx4 Staff did not begin braking out of Bayshore until shortly after the switch was de-installed, the following info largely comes from two ex Bayshore switchmen. Please note that Bayshore switchmen were unreliable sorts and well-known as alcoholics. The photo clearly depicts why SP employees called them "puzzle switches". You could stare at one of these contraptions forever, yet still possess a vague unease that you weren't sure where you were headed. Example: One day at the 4th & Townsend (now, King) Depot, my equipment was supposed to back-up over a puzzle switch that was being worked upon by a signal maintainer. The maintainer aligned the switch for us and radioed my brakeman that it was OK to bring 'em back. As my engine passed the switch, I heard the unmistakable ka-CLACK of wheel flanges trailing through misaligned switch points. Both the signal maintainer and the brakeman had studied the switch and thought that it was properly aligned. In truth, I probably would have made the same assessment. As it was, I was able to climb-off the engine and advise the maintainer before anyone in a dress shirt was the wiser. We surmise here that the puzzle switch seen here, whose point motors would be controlled by Bayshore Tower, was later installed where the men are standing at far left, between the two parallel switch leads containing the double crossover. Whether it was a new arrangement, or merley a lacement for a worn, existing device, we don't know. In later years, when Bayshore Tower closed (date? - help us out here, experts) the switch became a hand-throw job assigned to a switch tender. Switch tenders were a craft apart from switchmen, but many of them were ex-switchmen given the job by the company after suffering major irreversible physical harm, say, losing an arm, while banging boxcars. According to the aforementioned switchmen, the problems began when the company did away with switch tenders. All of a sudden, switchmen, brakemen, and worse hostler helpers - were noworced to confront the iron octopus. Since nobody could dependably figure out things (at night, it would have been a nightmare), movements ben to almost routinely headed for the ballast, so much so that the company was forced to locate a section crew there to deal with the frequent faux pax. Sometimes, he said, the section-men barely finished cleaning-up a derailment before the next movement plopped onto the ties. Apparently, this went on for some time before hard-headed company officials reluctantly concluded that the solution of the puzzle was a set of aforementioned crossover switches. Wx4 Staff was appreciative of that, because if there was one thing that guys did not want to see after dragging-in on the 12-hour Night Redwood Local, it was a puzzle switch! Two photos of the switch in tower days follow. This photo showing Coast Daylight #99 speeding through Bayshore station ca.1964 is a bit of a rarity, since the sun angle indicates summer, yet the sky is ABSOLUTELY CLEAR!!! Likely the wind is not blowing either! (note to the unfamiliar: Mark Twain purportedly once said that "The coldest winter I ever saw was the summer I spent in San Francisco." This goes double for Bayshore.) The negative is grainy, but #99's power seems to be E9 6054, E7B 5917 and E7A 6004, and the summer requisite dome car appears to be situated above H12-44 #1592's warning light. That blur is a Bayshore Tower window frame, and to the left of the on-spot 1592 is the infamous "puzzle switch".